This book was recommended to me by someone who said she couldn’t put it down, that it made her cry. I was equally entranced. The life history of Elizebeth (sic) Smith Friedman (1892 – 1980) was an example of truth being stranger (and WAY more interesting) than fiction. This is one of the “lost” stories of recent American history. We are now, finally, as decades pass and TOP SECRET ULTRA documents from World War II are declassified, learning what our relatives/ancestors were doing during World War II. My family is turning up some surprises. Has this happened to you? Do you need to ask your grandparents (quickly!) for the whole story? The book Code Girls by Liza Mundywas an excellent example of this. I blogged about it on December 2, 2017. What made Elizebeth Smith Friedman’s life more interesting than fiction? Elizebeth was so entirely self made! She was the youngest of nine children growing up on an Indiana farm, and was only the second of them to go to college. Her unsupportive father loaned her the money, and charged interest. She majored in literature and studied several languages, then worked briefly as a high school principal. One crucial, strikingly odd (and sometimes threatening) character in Elizebeth’s life was George Fabyan, a rich eccentric who patronized and cultivated an eclectic coterie of scientists and other intellectuals, many of whom lived at his Riverbank Estate outside Chicago. At Riverside Estate, Elizebeth met William F Friedman, also a Fabyan protégé. The two were married in 1917. Friedman had studied agriculture (at my alma mater, Michigan State University!) and later genetics, at Cornell. Fabyan employed Smith as a literary researcher and code breaker and Friedman as a plant geneticist. Elizebeth and William developed into groundbreaking cryptographers. The science of code breaking had barely been invented when they began to work together. Cryptanalysis is a science, but also a highly intuitive endeavor. Success depends on the ability to see patterns in letters, words or numbers that appear random. After World War I, during Prohibition, Elizebeth broke codes used by criminal bootleggers and rumrunners, and testified against notorious mobsters in court. This brought her a measure of public attention. World War II raised the stakes on cryptanalysis. Successful code breaking contributed greatly to the Allied victory. WHAT IF THE US AND GREAT BRITAIN HAD NOT BOTH BROKEN ENEMY CODES AND KEPT THEIR INTELLIGENCE CAPABILITIES SECRET?? This book caused me to wonder what my life would have been like if the Allies had lost WW II. Would I have grown up in an occupied country? How long would Facism have persisted? Was the Cold War inevitable? The nuclear arms race? Ironically, during World War II Elizebeth and William worked in different military agencies and were prohibited from discussing their assignments with each other. Loneliness was added to the other terrible wartime stresses they faced. William suffered from “nerves” (probably depression) at a time when little professional/medical help was available. Elizebeth “covered” for him and went to extremes to protect, support and encourage him. They loved each other devotedly for 52 years, until William died in 1969. After WW II, Elizebeth received much less attention than William. Only recently have historians paid serious attention to Elizebeth’s incredible genius and military contributions. Read this book! I predict it will be one of your favorites. Expensive Habits is an amusing discussion of the ways you can spend LOTS of money, if you have it. 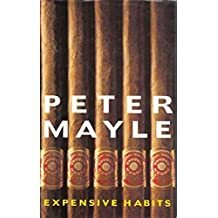 This could be tedious, but Mayle is so charming it’s easy to accept his obsession with the south of France. His descriptions of the countryside are so beautiful. But his best prose is saved for food and wine. Definitely an author for travelers! If you Google “Sahara Sands” you will find various businesses, but you won’t find anything about the patch of State (NJ) owned land I visited last Tuesday evening. A “frog slog” is a specialized nature walk. This one was sponsored by the Great Egg Harbor River Watershed Association, and took place as darkness fell. Around 16 people of varied ages attended. Most (but not all) were dressed for swampy conditions and insect pests. Many carried nets, and there were two portable aquaria. Frogs are, after all, vertebrates, and some are protected by law. We spent a few minutes listening to recordings of frog calls. We walked along a sand road and crossed through woods to a large, shallow pond. Those wearing high boots slogged out into the pond. The excitement began almost immediately. It was a perfect frog hunting night – warm and humid. Five or six species could be heard singing loudly at any one time. Various specimens were netted and photographed, along with insects, insect larvae and tadpoles. On our way back, a large bullfrog was caught. In the net, its familiar deep call (jug-o-rum, jug-o-rum) changed to a pathetic whimper, sounding like a human child! We turned him loose, and off he swam. WHY a frog walk? Because frogs are interesting, ecologically valuable and threatened by development. A frog walk is also a way of asserting the importance of Sahara Sands and other places that support wildlife like frogs. One of the “competing uses” for this land is recreation using off road vehicles (ORVs). Such use is incompatible with protection of wildlife. ORVs tear up the marshes and destroy native plants. The damage is largely irreversible. At Sahara Sands the conflict between these two uses has not been resolved, and it HAS been politicized. The more people who understand frogs and enjoy this wonderful PUBLICLY OWNED natural site, the better.